Hexxeh has made vanilla Chrome OS VirtualBox, VMware and USB drive images available for download so you can easily try out the latest Chrome OS nightly builds without having to compile it yourself. In my test, using Chrome OS in VirtualBox was painfully slow because you can't enable graphical acceleration so it's best to use the USB images. But if you must run it in VirtualBox (if for instance you can't boot of an USB), it would be ideal to assign it around 2 GB of RAM. If you think that's too much for a OS-Browser, you'd be surprised how much RAM Chrome (the browser) uses for some people. 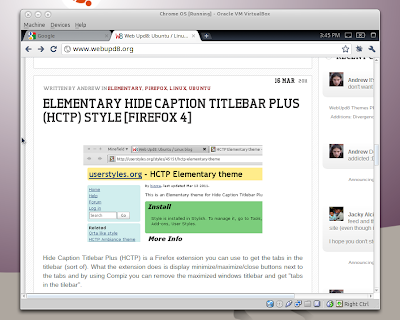 You're now ready to run Chrome OS in VirtualBox. 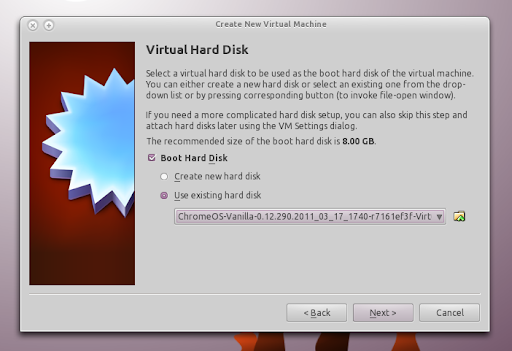 Download vanilla Chrome OS VirtualBox, VMware and usb image nightlies. Thanks to Chrome Story for the heads up!